Yesterday, my friend invited me to join her for Hardly Strictly Bluegrass in Golden Gate Park to see Chris Isaak. It's a free concert/music festival that takes place every year. The weather couldn't have been more beautiful this weekend, it was 80* here in the city! I figured, why not take advantage of the perfect weather and enjoy some live music in the park. It was my first time at Hardly Strictly, and I definitely would like to go back. It would be fun to arrive early, and post up with a blanket and cooler for the day to enjoy the sunshine (more likely fog), music, and epic people watching. It was a great way to spend a Sunday afternoon in the city. It was great seeing Chris Isaak, one of my favorite songs has always been Wicked Games, so it was fun to hear that live. He also played a few cover songs like Ring of Fire and Pretty Woman, so that was fun. I haven't spent much time in Golden Gate Park, but after walking through yesterday, I would love to spend a day wandering around and seeing all it has to offer. There are even buffalo hiding in there somewhere! And you can rent boats and paddle around on Stow Lake. It seems like my San Francisco Bucket List gets longer everyday. Shortly after I got home last night, Andrew and I noticed our house started to glow a soft shade of pink. We opened up our front windows, and saw the most beautiful sunset. This photo doesn't do it justice. It seemed like my entire Instagram feed was snapshots of the San Francisco sky last night. It was truly breathtaking. This looks like so much fun!!! I tried to go on Saturday and stupidly drove with a friend and of course couldn't find parking :( The sunsets have been AMAZING lately!!! This looks FUN! What a beautiful sunset! A perfect weekend for that concert! Um excuse me....I needed to be there. How fun! I love Golden Gate park! And that sunset? I miss CA sunsets. They aren't the same here. That IS a beautiful sunset! Great photo. 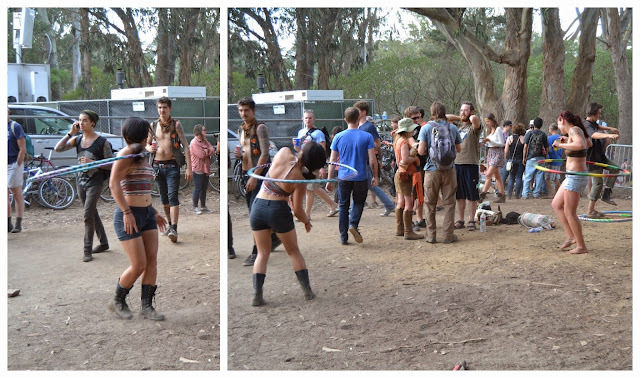 You are brave for going to hardly strictly!! i havent been. russ went last year and seeing the state he was in when he got home at 5pm im not sure i could hang! GG park is amazing though! ive been several times and i feel like i havent seen half of it!